Nearly half (48%) of Americans say the decision to use military force was wrong, while slightly fewer (43%) say it was the right decision, according to a Pew Research Center survey, conducted March 7-14 among 1,466 adults. Current opinions about the war in Iraq are little different than in early 2014, when 50% said the decision to use force was wrong and 38% said it was right. Support for the decision to use military force in Iraq had declined considerably over the course of the war and its aftermath. 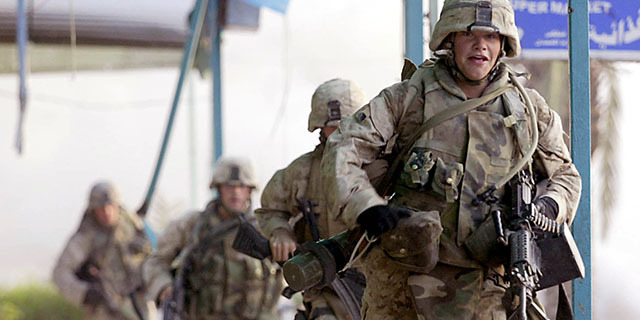 In late March 2003, a few days after the U.S. invasion, 71% supported the decision to use military force, while just 22% said it was the wrong decision. Opinions about the use of military force in Iraq have been divided along partisan lines since the start of the Iraq War, and during the debate that preceded it. Today, a majority of Republicans and Republican-leaning independents (61%) say the decision to use force was right, compared with just 27% of Democrats and Democratic leaners. While both Republicans and Democrats were more supportive of the war initially than they are today, the partisan gap is roughly the same as it was then. In late March 2003, 89% of Republicans and 53% of Democrats endorsed the decision to use military force in Iraq. Opinions about whether the U.S. achieved its goals in Iraq are more negative than positive. More Americans say the U.S. “mostly failed” in achieving its goals in Iraq (53%) than say the U.S. succeeded (39%). These views are largely unchanged from early 2014. Before 2014, however, the public generally viewed the Iraq War as successful, though views were mixed at times. A month before the last U.S. combat troops were withdrawn in December 2011, a majority of Americans (56%) said the U.S. had mostly achieved its goals in Iraq, compared with a third saying it had failed. By January 2014, these views had flipped: 52% said the U.S. mostly failed and 37% said it mostly succeeded. Partisan differences in attitudes about whether the U.S. succeeded in Iraq are not as stark as divisions over the decision to go to war. About half of Republicans (48%) and just 30% of Democrats say the U.S. mostly succeeded in achieving its goals in Iraq. There is a wide ideological gap regarding whether the U.S. succeeded in Iraq among Democrats. Only 18% of liberal Democrats say the U.S. mostly succeeded in achieving its goals, compared with 39% of conservative and moderate Democrats. There is little difference between conservative Republicans (50%) and moderate and liberal Republicans (43%). 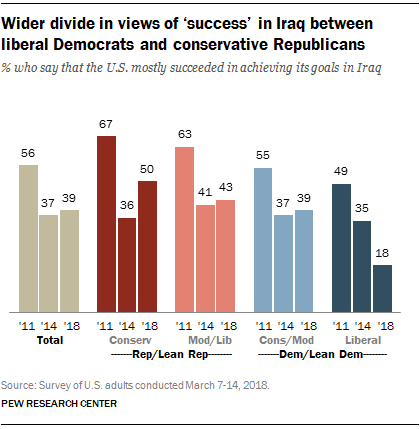 Views regarding the success of the U.S. in Iraq fell in both parties among all ideological groups between 2011 and 2014, but the share of liberal Democrats saying the U.S. achieved its goals in Iraq has fallen further since then. About half of liberal Democrats (49%) said the U.S. had succeeded in 2011. That share fell to about a third (35%) in 2014 and then fell again to about one-in-five (18%) today. By contrast, conservative Republicans are more likely to say the U.S. mostly succeeded in Iraq today (50%) than they were in 2014 (36%). There has been less change since then in opinions among other ideological groups. Note: Click here for full methodology and topline (PDF).